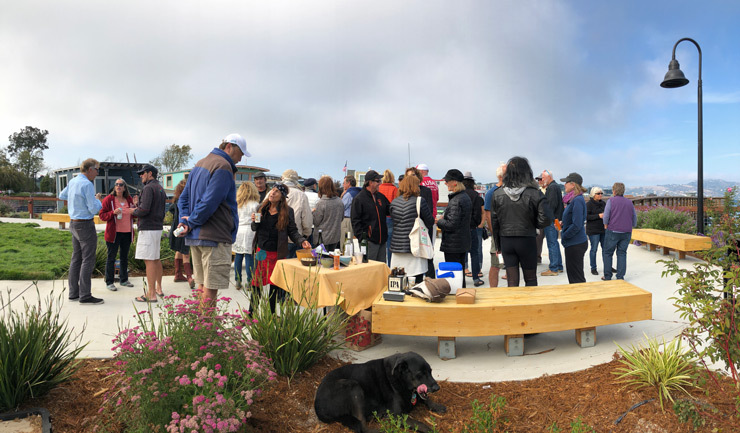 The award-winning landscape around the new Waldo Point Harbor Park has inspired the Floating Homes Association to throw a party! Join us for FHA Day in the Park from 2 to 5 p.m. on Sunday, Oct. 21. The free and family-friendly party will feature live music by talented residents, including Edo Castro-Woodhouse, Marty Atkinson & Katy, and Davey Jones. Got a cute pet? Bring your dog on leash in a Halloween costume to the park. We’ll vote for the cutest costume at 4 p.m.
Get connected! It will be a great time to meet new neighbors and longtime friends in our waterfront community. You can also hear about the FHA’s work and renew your membership, learn about a new family group that is forming, and help restore the Charles Van Damme smokestack and paddle wheel. Come hungry! Davey Jones will be making vegetarian and seafood chowder, and it’s free! Bring your own bowl, spoon, and a beverage to share. Break out your picnic blankets and beach chairs, and we will see you for a day in the WPH park!